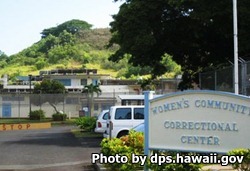 Women's Community Correctional Center is located in Kailua Hawaii. It is the only women's prison in the entire State. It houses minimum, medium and maximum custody offenders. In addition to long term commitments, this facility houses pre-trial inmates. Offenders have access to substance abuse treatment, domestic violence treatment, parenting and educational classes. Inmates incarcerated here can be selected to participate in a variety of community service projects and work in supervised support roles for various county agencies. Inmates must wait thirty days before they can receive deposits to their trust fund. You must be on the inmate's approved visitation list to send funds. Only cashier's check and official checks are accepted for deposit. The check must be made payable to "Women's Community Correctional Center" and put the inmates name and ID number in the memo line. Mail the completed check to the inmate and it will be placed in the proper account. Visiting for the general population, Kaala, Ahiki, and Maunawili Cottages occurs on Saturdays and Sundays from 8am-10am. Each of the cottages are allowed one day of the weekend for visitors. The day is rotated each month, so you should contact the institution to see which rotation they are currently in. Olomana Cottage has visitation every Saturday and Sunday from 8am-9:30am. You must arrive no later than 9am or you will not be admitted to visitation.